I know, Sharepoint 2007 is pretty old. 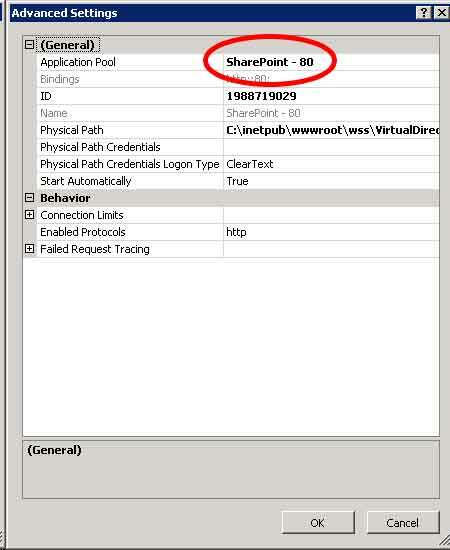 However, this week a client wanted FBA for his WSS 3 environment, so no problemo for the Sharepoint pro. 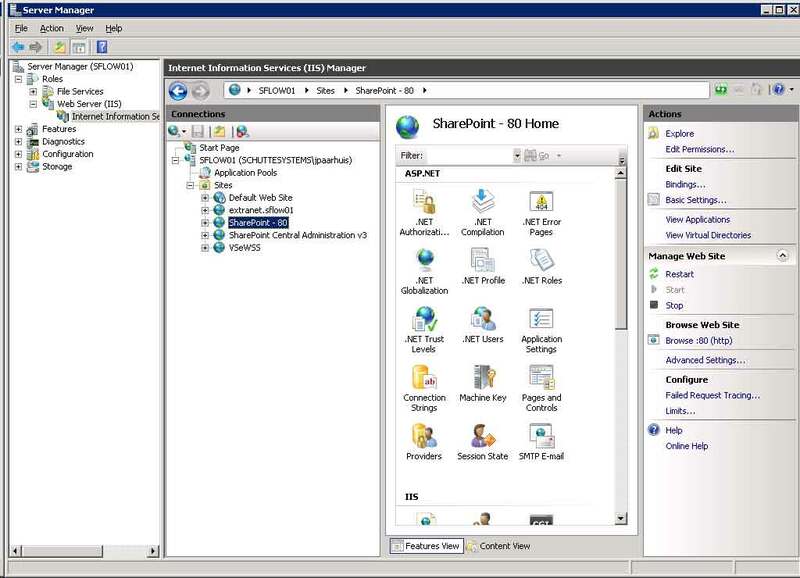 I haven’t done a FBA config for Sharepoint 2007 before, so I did a bit of googling and couldn’t find a very explaining article that covers the whole configuration. There were a few handy sites, including the MSDN, which helped me out getting what I needed. 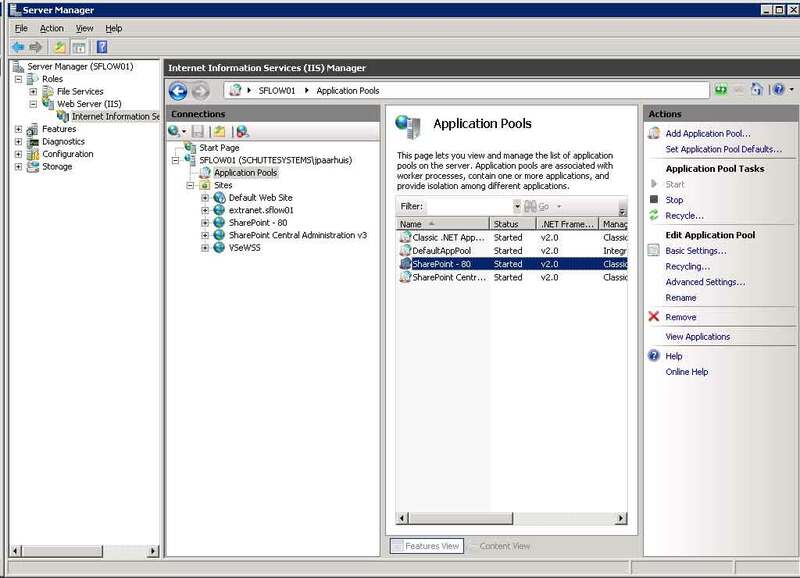 Choose the option to configure SQL Server for application services. Choose the name of the database server in the server field. Choose Windows authentication and type a database name in the Database dropdown field. In this case we creat a database with the name fbadb. Click next and Finish to complete the creation of the membership database. Because we wan´t to use integrated security with the connection we need to give the application pool identity the appropriate permissions on the membership database. First of all we need to know what the application pool identity is. For that you can go to the IIS Manager and select the Sharepoint site. Now, go to SQL management studio and give that user the db_owner permissions on the FBA database we just created. Open Central Administration. Go to Create or extend web application in Application Management and click Extend an existing web application. In web application select the web application you wish to create FBA for. However we are extending a web application, we need to create a new IIS web site so leave that option on. Allow anonymous authentication and here you can also choose to use SSL or not. I choose not to use SSL. The last thing to do is to set the zone to Internet. 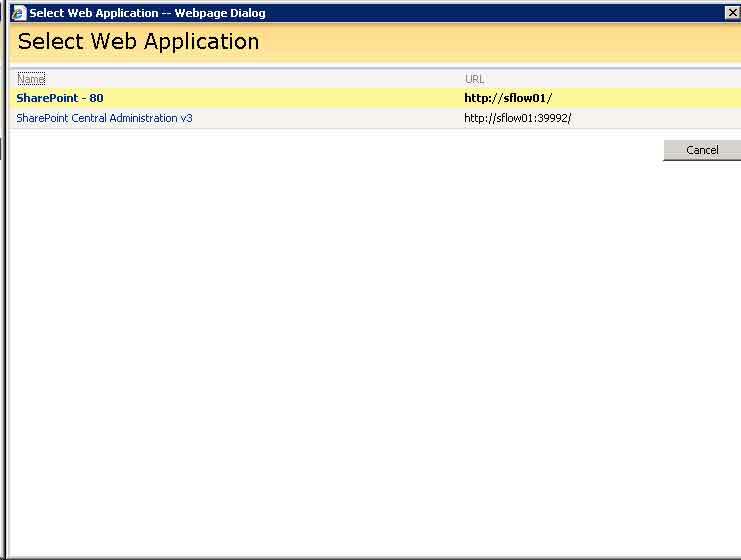 You can go to the url of the extended web application to check if the configuration works. Last thing to do is to enable FBA on the extended web application. Go back to Central Administration and then click Authentication providers under Application Security. Then click on the Internet zone. In this screen select the Forms authentication type. Two new fields appear: Membership provider name and Role manager name. This are the names of the membership and role provider we are going to configure in the next step. 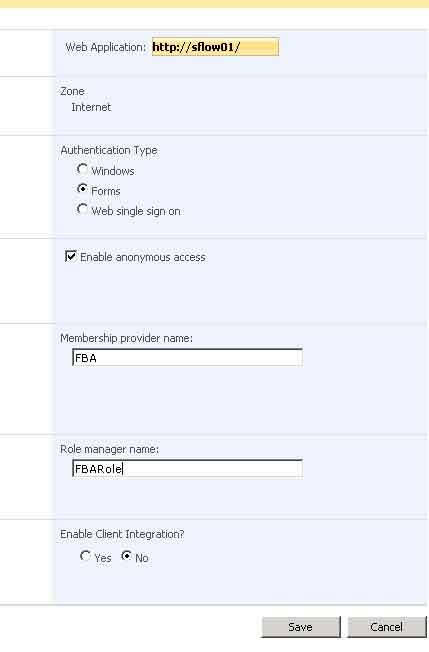 I’m using FBA for Membership provider name and FBARole for the role manager name. Click Save and all central admin settings are set. 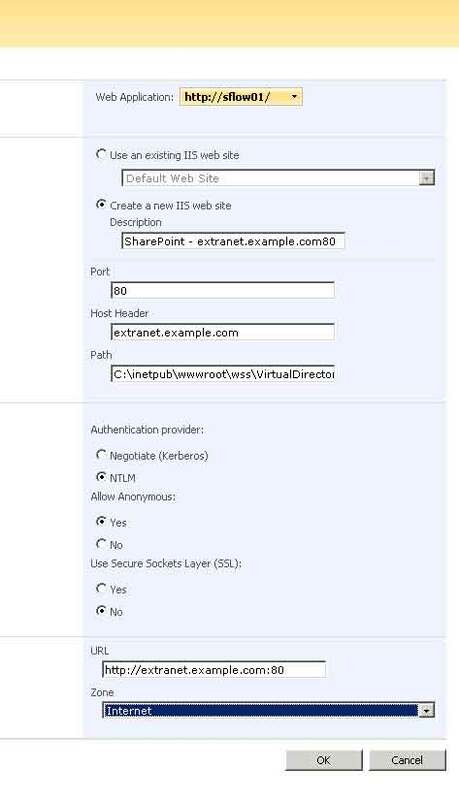 Go to the web.config of the web application (not the extended web application) and search for the </sharepoint> closing tag and the <system.web> starting tag; they should be next to eachother. Because I run the database and Sharepoint on the same server I’m using localhost. If you are using a different database server you need to replace localhost with the database server name or ip here, pretty obvious. <add connectionStringName="fbaSQL" applicationName="/" name="FBA" type="System.Web.Security.SqlMembershipProvider, System.Web, Version=2.0.3600.0, Culture=neutral, PublicKeyToken=b03f5f7f11d50a3a"
This web.config is done. 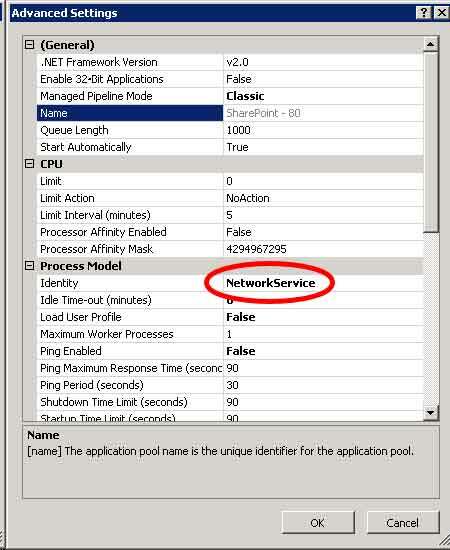 Now do the same for the web.config of the extended web application. Save the file and execute it as administrator. Don’t be scared with the file not found and solution not found messages for the first few lines, because thats entirely normal. All configuration is done. Go to the site settings of the sitecollection. Under site collection administration you find two new links. 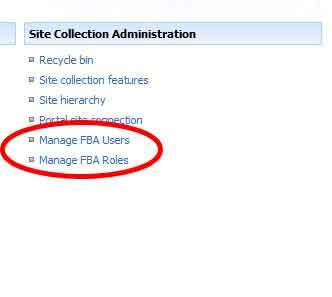 With Manage FBA Users you can add and edit users and with Manage FBA Roles you can add and edit roles, which is pretty straightforward. To test FBA you can add a user and give the user some permissions by adding it to the Team Site Members group. Now, login with the user on the extended web application and see the result.